Percy Jackson isn’t expecting freshman orientation to be any fun. But when a mysterious mortal acquaintance appears on campus, followed by demon cheerleaders, things quickly move from bad to diabolical. In this latest installment of the blockbuster series, time is running out as war between the Olympians and the evil Titan lord Kronos draws near. Even the safe haven of Camp Half-Blood grows more vulnerable by the minute as Kronos’s army prepares to invade its once impenetrable borders. To stop them, Percy and his demigod friends must set out on a quest through the Labyrinth—a sprawling underground world with stunning surprises at every turn. Full of humor and heart-pounding action, this fourth book promises to be their most thrilling adventure yet. Is is heresy to say I like this series better than Harry Potter? One of my favorite YA series. Riordan's characters are fun and believable and I love the mythology aspects of it. By this book, things are starting to get a bit dark, but I feel like you grow with the books - kind of like in HP. Another thrilling installment of Percy Jackson's life. In this book, we get to meet more new characters, including Rachel, who has the awesome ability of sight. No, not foresight or second sight or anything... I mean, she's just a regular mortal with working eyes... but she is fun and spunky. 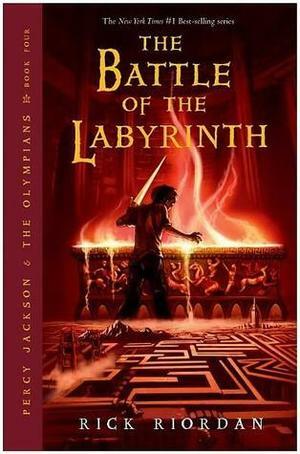 Kronos is making things difficult for Percy, and so Percy and his friends enter the Labyrinth to try to prevent all out war from showing up at Camp Half-blood's door-step. Each character comes into their own a little more in this book, and we get to see Grover's girlfriend angry enough to "tan someone's backside" with a switch, which I thought was hilarious. I have to admit that I am a little jealous of Nico's ability... I mean, how cool is he??? Grover finally finds what he is looking for, but it is not what he expected. Annabeth offends a goddess and might have sealed her own fate in doing so, and Percy sets off a chain of events, including an eruption on Mt. St. Helens that could have disastrous consequences. Gradually, we are putting together the pieces of the story, and things will come to a head in the last book. Off to find out what happens.